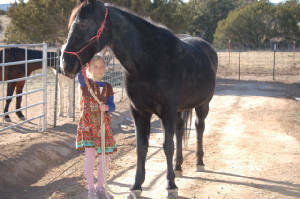 Bea is an 18-year-old Tennessee Walker who had a positive 76% EPM diagnosis, a condition caused by a protozoa based virus that attacks the central nervous system. 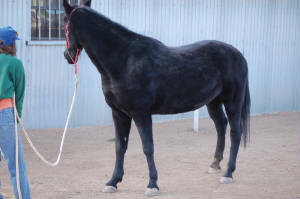 She was showing symptoms of ataxia, which in her body were characterized by leaning against the barn, a wobbly, uncertain gait, intermittent lameness and irregular stance. I began working with her at the end of October, 2009. At that time, Bea did not want me to touch her head or neck, so I worked on her sacrum and hindquarter area. By the end of the session she had dropped her head, was walking more fluidly. Bea had a tendency to stand strangely, camping out her hind legs and splaying forelegs, particularly the left. She often would lean on me while I was working on her. For the first six weeks after diagnosis she was on the EPM medication Marquis. 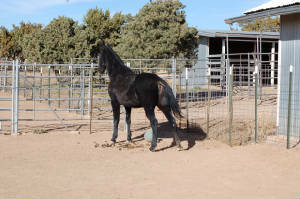 After her 11/07 Ortho session, her hind legs were no longer dragging, and the front left was not tipped laterally as often. 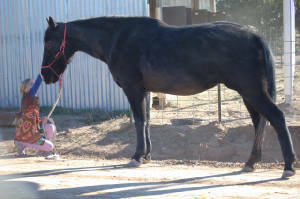 This stance was unstable for Bea, and often she would stand with hind legs pointing off to one side with fore legs pointing the opposite direction. Same day, Bea with more relaxed stance after bodywork. By 11/27, Bea is standing more squarely. By the end of November of 2009, Bea was holding the Ortho-Bionomy work very nicely in some areas. 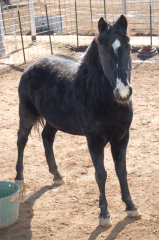 She was frisky, and showed improvement in all limbs and standing and walking posture. There were still some areas requiring support so she continues with bodywork. Besides the "structural" changes that you see, Ortho-Bionomy is addressing the nervous and endocrine systems, and in so doing, allowing Bea's own ability to self-correct to grow. Nearing the end of February 2010, Bea tracks nicely and irregular standing has become far less frequent, she seems more integrated and "fluffier" in general.